The Internet Never Sleeps: Case Studies of how Airlines Use Social Media and How This reflects on their Brand Image and Degree of Dedication to Customer Care - Harold Tor. Earlier this month, I wrote about how Finnair and the Helsinki Airport made very good use of social media to gather information about their clients and on how to enhance an air traveller’s experience the moment he steps into one airport until he leaves another. The airline industry is such an interesting model for analysing the use of social media marketing and communications, because of its multinational and multilingual nature. Thanks to my (other) better half, I got wind of an interview that Socialbakers.com conducted with Gert Wim ter Haar, the Social Media Hub Manager of KLM Royal Dutch Airlines, entitled “How KLM Achieves such Stellar Success on Social Media”. If you have time, have a read. It is enlightening to find out how KLM realised the potential of social media during the 2010 Icelandic ash cloud incident, its journey since then, and when it won the SimpliFlying ‘Best Airline on Social Media‘ Award in 2012. Gert Wim ter Haar is but one of the 100 social media employees managing KLM’s 24/7 customer care service in nine different languages: Dutch, English, Spanish, German, Portuguese, Japanese, Norwegian, Russian and Italian. Currently, they are looking into using other platforms apart from Facebook and Twitter, in countries whether these are less popular or not available, such as VKontakte in Russian-speaking countries and Sina Weibo in Chinese-speaking countries. Normally, I do not encourage using the number of followers to quantify the success of an organisation’s Twitter engagements, it is the quality of the interactions that matters. 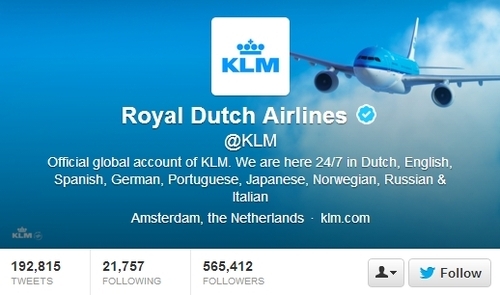 However, in the case of KLM, looking at the quality interaction its Twitter account has with its customers, the number of followers swell to over a phenomenal 565,000. Looking at the stellar success of KLM, I undertook to analyse the other carriers’ Twitter engagement, in an attempt to find out how KLM did well, and why the others did not. 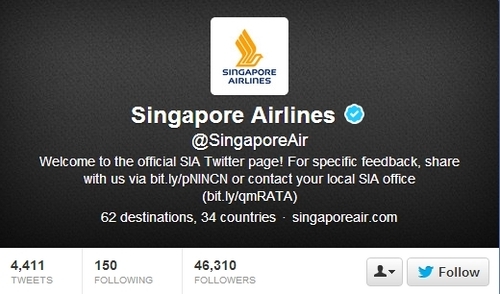 If you look at the Twitter account of Singapore Airlines, they claim that they fly to 62 destinations in 34 countries. Yet their tweets reveal that they are basically monolingual in English, and make no attempt to interact with their customers at all. It is basically a news slash link broadcast mechanism. The low priority they place on Twitter is evident by the low number of people they follow (150). 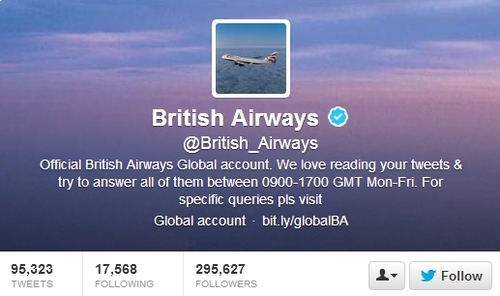 Another monolingual airline is British Airways. They claim to ‘love reading your tweets’, but they can only answer you ‘between 0900-1700 GMT Mon-Fri’. Which is an even greater crime than their monolingualism. So if you do not speak English, you encounter problems during transit, no staff is at the transit desk because it was past midnight, and even if they were they could not understand you, your only option is to tweet. Yet, this option is closed to you because British Airways staff has knocked off. The same crime is committed by Brussels Airlines whose social media staff is only ‘at your service‘ on ‘weekdays 9am-5pm’, presumably GMT+1. First of all, as an airline, you should know that your business is global. With your planes in the air at any given moment in any part of the globe, your customers are giving you business not matter what time of the day it is at your head office. Secondly, the internet does not switch off the moment your staff goes home. A missed interaction is a lost opportunity, and a negative impression. 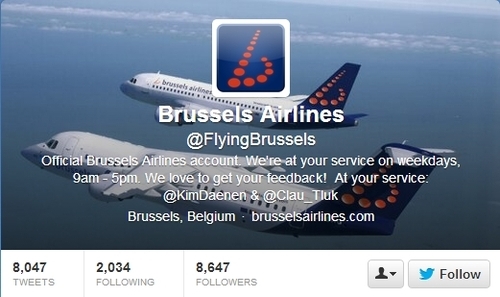 It also shows that your company only has one, at most two, persons (Brussels Airlines is even very upfront about their lack of investment in the area, looking at their Twitter page) working on interacting with customers on social media. Not only is the language choice restricted, so is the time it takes to respond to concerns, which is much longer than acceptable by your customers. Most worrisome of all, it shouts out all over the Twitterscape that your company’s personnel cares only about their concerns, not your customers’. It basically says you are a bureaucratic organisation that cannot act quickly to your customer’s genuine concerns. Middle Eastern airlines are really up and coming. They are highly profitable, luxurious and affordable. They offer great service provided by friendly cabin crew. The transit points are well located so that long haul passengers can get to stretch their legs for a few hours before continuing the other half of the journey. 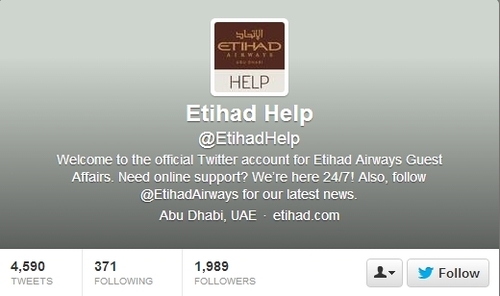 But, and that is a big but, airlines such as Etihad Airways are still traditional business animals. 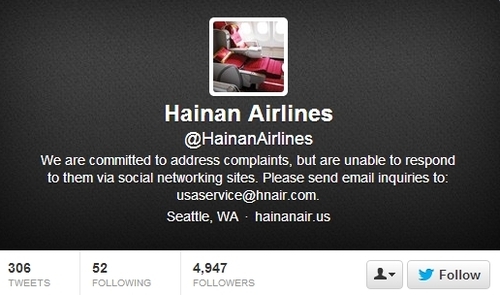 They do not like to have complaints out in the open for everyone to see, much like Singapore Airlines. Hence they created another Twitter account specifically for customer care, which is fair enough maintained 24/7, unlike most European carriers. 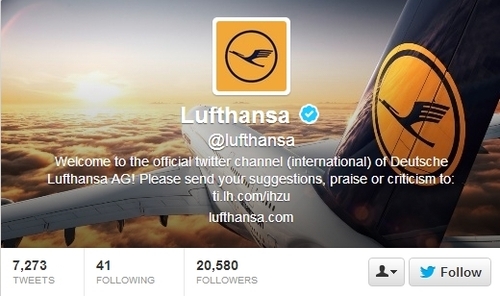 Another common tactic to avoid having criticisms displayed on Twitter is Lufthansa‘s. Like Etihad, Lufthansa has two Twitter accounts. Unlike Etihad, Lufthansa’s account are divided into language groups: one ‘international’ (namely, in English) the other in German. For both accounts, the company instructs you to send ‘praise, suggestion or criticism‘ to TWO DIFFERENT shortened URL, which BOTH… led to NOWHERE. The fault committed by Hainan is clear. 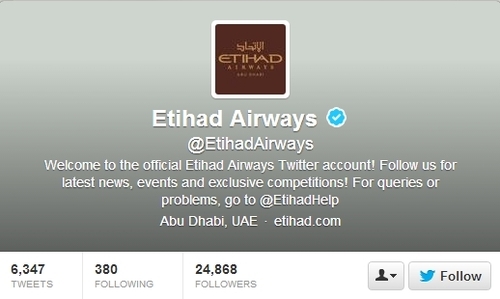 But the tactics of Etihad and Lufthansa only backfire, even though they are more subtle. They fail to understand that the customer should not be made to go to another Twitter account (either because of language or because of you channelling different accounts for different usage) or onto your formal complaint mechanism by phone or on a website. There should only be one account as that one point of contact on Twitter, where good customer service for one serves as free publicity for all other customers. Even if you want to use it as a news broadcast at the same time, customers love to have your news because they have enjoyed good services from you. Looking at the analysis above, the success of KLM on Twitter can easily be understood, and so are the failures of the other airlines. KLM succeeded because they have the right philosophy about the use of social media in their interactions with customers: A happy customer is the ultimate ROI, not some astronomical Twitter followers. With that, KLM made sure they respond to each customer within the hour, and are ‘currently investigating the possibilities of further reducing this response time’.